The Ford Mustang is one of the most popular muscle cars in history. It remains a popular choice for the folks seeking a strong dose of driving excitement. Iconic styling makes this legendary ride even more appealing. While the 2019 Ford Mustang brings a lot of great qualities to the table, it still may not be the best choice for everyone. This year, the 2019 Ford Mustang offers a new B&O premium sound system. Mustang fans can also rejoice in the return of the limited-production Bullitt model. Furthermore, even four-cylinder models can now be equipped with an active-valve performance exhaust. To make the four-cylinder Mustang more appealing, Ford decided to offer a performance package that includes stiffer springs and upgraded tires. If you’re seeking fuel savings, stick with the Mustang’s base engine. Ford tuned the 2.3-liter, EcoBoost four-cylinder engine to develop an entertaining 310 horsepower and 350 pound-feet of torque. With a 0-60 time of around 5.4 seconds, the four-cylinder Mustang is definitely quick enough to get your adrenaline pumping. When equipped with an automatic transmission, expect the 2019 Ford Mustang to return an economical 21 mpg in the city and up to 32 mpg on the highway. Die-hard muscle car enthusiasts won’t be able to resist the 2019 Ford Mustang GT’s V8 engine. It pumps out a brawny 460 horsepower and 420 pound-feet of torque. Ford’s active-valve performance exhaust makes the Mustang GT sound especially aggressive. There’s definitely no overlooking the V8-powered Mustang’s strong acceleration. Professional drivers were able to hit 60 mph in a sensational 4.2 seconds. You can have fun shifting your own gears with the manual transmission or opt for a new 10-speed automatic. The 2019 Ford Mustang GT350 is specifically engineered to compete on the track. It comes equipped with a high-revving, Voodoo V8 engine. Ford rates the engine to develop a formidable 526 horsepower. While the GT350 model is definitely quick, razor-sharp handling is what sets it apart from the other models. The 2019 GT350 comes standard with an upgraded set of Michelin Pilot Sport Cup 2 tires and a more aerodynamic rear spoiler. For years, drivers complained about the Mustang’s rather bumpy ride. Fortunately, the muscle car’s ride quality has improved greatly. Its independent rear suspension does a great job of absorbing rough asphalt. This is good news for the folks who plan to use their 2019 Ford Mustang as a daily-driver. The Mustang is also a great car for traveling out of town. Although models equipped with the optional performance package ride a bit harsher, most drivers won’t have any complaints. Some people consider the Bullitt to be one of the most cherished Mustangs in history. There are a number of styling cues that help it to stand out. You’ll immediately notice the Bullitt model’s blacked-out mesh grille and special black wheels. A Highland Green paint job adds the finishing touches. On the inside, a cue-ball shift knob adds a sense of nostalgia. However, the Bullitt model isn’t just for show. Its V8 engine was tweaked to generate an extra 20 horsepower. 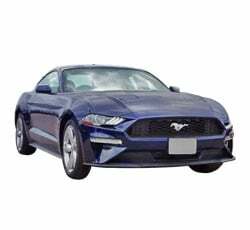 Unlike a tiny sports car, the 2019 Ford Mustang provides great comfort on the road. While there’s not much room in the back, even tall drivers can easily fit behind the wheel. The standard seats provide an excellent amount of support. However, available heated and cooled seats help you to further relax. It’s a fun car that you won’t mind driving across the country. There’s also enough cargo space in the trunk for you to fit your extra travel bags. The standard audio system in the 2019 Ford Mustang will appease most drivers. Nevertheless, serious music fans will desire a bit more thump. You can expect the optional B&O sound system to really crank up the Mustang’s fun factor. It comes equipped with a total of 12 speakers, which surround you with high-quality sound. Meanwhile, a built-in subwoofer enables the system to produce an abundance of deep bass. Although it adds to the Mustang’s cost, music lovers won’t mind spending the extra cash. Some people will prefer the Mustang’s traditional gauges. This is especially true for the drivers who don’t care for modern technology. If you want to take your driving experience to the next level, consider getting the optional digital gauge cluster. It features a 12-inch LCD screen, which is fully customizable. You can even change the color to suit your mood. While behind the wheel, you’ll be able to easily access vital information such as engine temperature and oil pressure. Expect the 2019 Ford Mustang to turn plenty of heads. A fastback roof highlights its sleek profile. LED lightning and twin exhaust outlets come standard. Some of the attention-grabbing paint colors include Velocity Blue Metallic, Ruby Red Metallic, and Shadow Black. Several unique wheel designs are available. For the drivers who want to make a bolder statement, Ford offers the California Special package. It outfits the Mustang GT with exclusive stripes and a unique front fascia. Despite the Mustang’s reputation for being scary, it’s actually among the safest performance cars on the market. A five-star overall safety rating proves that the Mustang provides top-notch impact protection. Parents will appreciate Ford’s MyKey system, which allows them to set a speed limit. Some helpful driving aids are available as well. While forward collision warning with automatic braking can bring you to a stop during panic situations, blind-spot monitoring helps you to dodge danger on the highway. Unfortunately, the 2019 Ford Mustang is not a good choice for traveling in wintry weather. You won’t be able to enjoy the enhanced traction of an all-wheel-drive system. Because the Mustang only sends power to the rear wheels, it doesn’t inspire a lot of confidence in the snow. If you’re looking for a muscle car that offers an AWD system, consider the 2019 Dodge Challenger and the 2019 Jaguar F-TYPE. There’s not much room in the Mustang’s backseat. Only small children will have enough space to stretch out. Furthermore, the car’s two-door design makes it difficult for families to get in and out. Although there's sufficient space in the Mustang's trunk, convertibles models will naturally sacrifice some room. Four-door muscle cars, such as the Dodge Charger, offer a lot more practicality. Last year, Ford decided to discontinue the Mustang’s V6 engine. Understandably, this decision disappointed some people. The V6 engine was relatively efficient, powerful, and easy to maintain. Most importantly, it was inexpensive. The Mustang’s handling has improved substantially over the last few years. Nevertheless, this muscle car does carry around a few extra heft. In fact, it weighs roughly 3,600 pounds. This could be a factor for the drivers seeking a lightweight track car. By comparison, the 2019 Subaru BRZ tips the scales at only 2,800 pounds. As always, the 2019 Ford Mustang goes head-to-head against the 2019 Chevrolet Camaro. Many test drivers consider the Mustang to be more comfortable. Meanwhile, the Dodge Challenger doesn’t feel nearly as agile as the 2019 Ford Mustang. When driving around a race course, you’ll immediately notice the Mustang’s better handling. Although the 2019 Nissan 370Z is also in the Mustang’s price range, it doesn’t accelerate as quickly. In terms of style and comfort, the 2019 Ford Mustang matches up well with virtually every car in its class. While there’s no overlooking the Mustang’s exciting performance capabilities, it’s still easy to drive. Admirable fuel economy gives you another reason to choose the new Mustang. However, don't make the mistake of buying this muscle car as your main family vehicle.